This review modified from an original review in the Tuesday, June 5 issue of Shelf Awareness for Readers. If you don't already subscribe, sign up here to receive a bi-weekly dose of readerly goodness in your inbox. Blum, a correspondent for Wired, begins with the creation of the Internet, noting that despite the groundbreaking nature of the moment, it was actually a little-understood moment in technological history. Like oxygen, the Internet is not something we question, but something we take for granted. Tubes, with its detailed account of everything from the physical structures of the network to the practicalities of laying fiber underground, changes that, giving readers a newfound appreciation of the networks that have changed our way of life to the very core. Blum's uncovering of the physical nature of the Internet also gives readers new insight into how it came to be the way it is: why Google has buildings in certain locations, why collaboration is so critical to the Internet's continued success or how one woman with a shovel can accidentally knock the entire country of Armenia offline (that really happened, by the way). 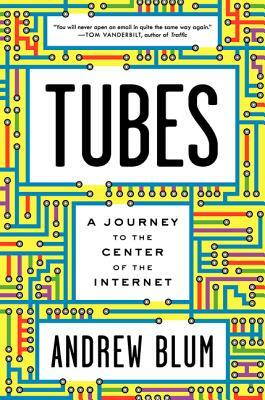 Tubes is fascinating reading for anyone with even a passing interest in the Internet--and since you're here reading this on a blog (or in a reader, or on your phone, or whatever the case may be), that means you. Mind. Blown. I just recently came across this book and added it to my TBR. It certainly looks interesting and as much as I rely on the internet, I certainly don't know that much about it and how it works. After reading your review, I can't wait to read it!